The rotating biological contactor (RBC) has been used in Europe for many years to treat both municipal and industrial waste waters. RBC’s produce a high quality effluent. RBC’s are fixed-film reactors similar to bio filters in that organisms are attached to support media. The support media of RBCs are slowly rotating discs that are partially submerged in flowing waste water in the reactor. Oxygen is supplied to the attached bio-film from the air when the film is out of the liquid and from the liquid when submerged, since oxygen is transferred to the waste water by surface turbulence created by the discs’ rotation. Sloughed pieces of bio-film are removed in secondary sedimentation tank in the same manner described for trickling filters. The RBC with a series of large discs in which the microorganisms are housed, and these discs are supported on a single shaft which is slowly rotated through the waste water. The RBC is covered by a removable fiberglass housing which has access portals at each end. The discs are covered with a thick coating of slime of microorganisms, which treat the waste water. RBC’s act much like a trickling filter in that the contactors perform well at removing BOD and converting ammonia NH4) to nitrates (NO3). The BOD removal efficiency of an RBC is about 85%. A biological film or bio-mass grows on the surface of a series of discs mounted on a shaft and placed in a tank conforming to the general shape of the discs. The discs are usually of plastic or some other non-corrosive durable material. The discs are slowly rotating while approximately one- third to one-half immersed in the waste water being treated. 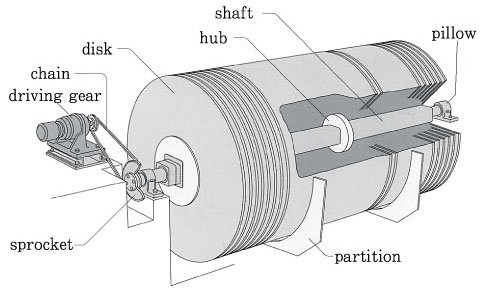 The rotation rate is usually about 2 – 4 rpm. As the disc rotates, an attached microbial population forms a film that becomes several millimeters thick. Rotation of the disc brings the attached biologic film into contact with the wastewater for removal of the organics and with the atmosphere for absorption of oxygen. 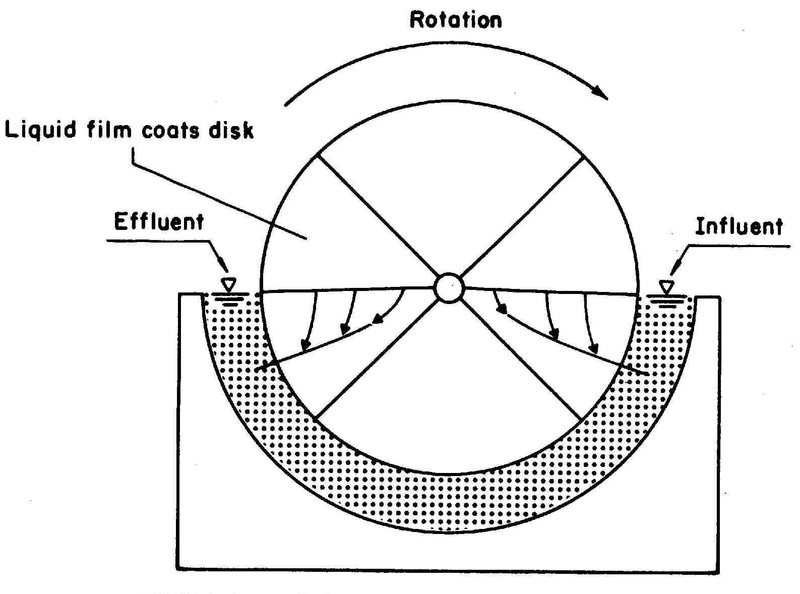 Excess bio-mass generated during the cycle is stripped off by shearing forces exerted as the discs rotate. The sheared excess bio-mass is usually removed in a secondary clarifier that follows the rotating disc process. The process has shown to be effective in the treatment of wastewater with BOD removals up to 85% for a disc surface loading of 80 to 120 Lpd per m2 of surface area. The process is inherently stable under conditions of fluctuating hydraulic and BOD loads. Excess slime, which has built up on the RBC has been sloughed off into the wastewater. Hence, after being treated in an RBC, the wastewater is sent to the secondary settling tank (SST). This sloughed off slime and other sludge settle to the bottom of the SST and the effluent is discharged for disposal. The sludge from the SST is pumped to the sludge digester for further treatment. The use of simple mechanical components for the process hardware also results in very low maintenance cost. Maintenance is largely limited to greasing of bearings and inspecting the chains and sprockets for wear and slack. The low disc speed used in the bio-disc process achieves sufficient mixing and aeration while consuming relatively little power. The Rotating Biological Contractor RBC is the most efficient waste water treatment technology available in the world. These systems can be designed to scale and grow with your community or resource applications. Primary and Tertiary filtration technologies can be added before or after the RBC treatment to improve water clarity for discharge directly into a water stream, or returned for recycle, water reuse and even drinking water. about Water and waste water treatment guide helped for my semester examination.thanks. Hi. About design rotating biological contactor guide helped for me.Thanks. Could you please advice the method of maintenance if we would like to replace some of the broken disc in the middle?